Do you order the same item off the menu every time you go out to eat? I can’t do that. To me that would be like paying my $12.50 for a ticket to watch a movie I’ve already seen a second time… and a third… and a fourth… and so on. And thus when it comes to restaurant dining, I like to mix it up once in awhile. Try something new and adventurous, maybe something I’ve never had before, and oftentimes something entirely too dangerous and death-defying. Last week, Megan and I decided to embark off our culinary beaten path and dine on a recommendation by Katharine Shilcutt of the Houston Press, who recommended Blue Nile Ethiopian Cuisine here in Houston. We figured since Katherine is such an unabashed foodie and raved about this place, it might be an excellent opportunity to try something new. How much do you know about the country of Ethiopia? Before I give you my take on the dining experience at Blue Nile, let me give you some background information on country and culture. As a country, Ethiopia has been an independent nation since ancient times, their roots dating back well-over a millennia to 10th century BC. It’s also one of the oldest sites on record of human existence and may be the point where homo sapiens first ventures forth from Africa into the middle east and the rest of the world. That’s right boys and girls, this place is truly the cradle of life. 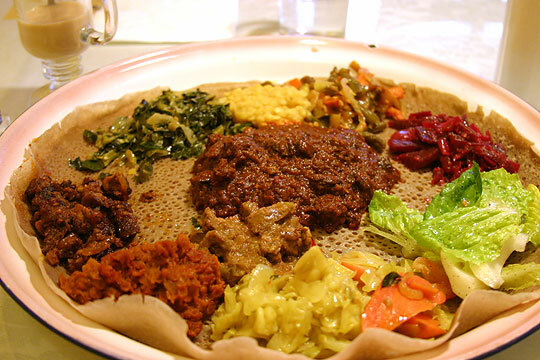 In Ethiopian dining custom, meals are typically serves on a large platter around which family and guests gather. 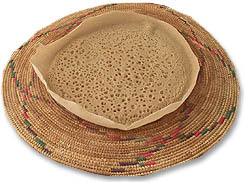 These platters, usually composed of weaved baskets, are lined with a pancake-like bread called injera, which is made with an Ethiopian grain called teff, which is recognized as one of the smallest grains the world. Ethiopians do not use dining utensils. Pieces of injera are torn off with the right hand and used to scoop up food, much like naan and tortillas. 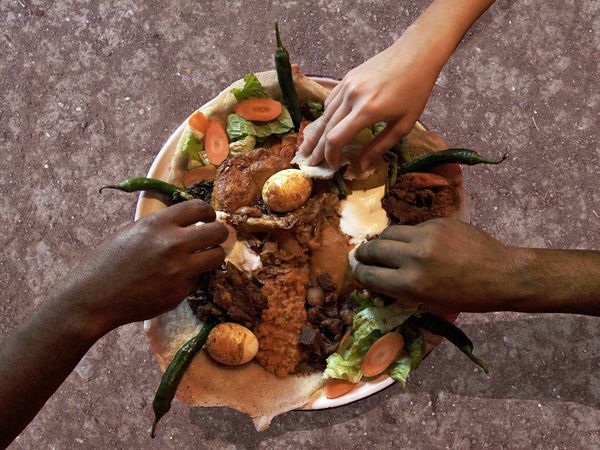 In Ethiopian custom, it’s considered rude to use the left hand when dining. And when you’re full, expect to be urged to take more food. Providing an abundance of food is a sign of hospitality. As I mentioned previously, we had no knowledge of Ethiopian dining custom nor any familiarity with Ethiopian cuisine before we went to Blue Nile last week. They could seriously have served me chicken enchiladas and I would have been none the wiser. Blue Nile’s location is fairly low-key. They are in a fairly nondescript strip mall on Richmond Avenue in between Gessner & Fondren. The strip mall itself looks sketchy but the interior of Blue Nile’s dining room is well-decorated and clean. The staff at provided prompt and polite service. We were sat quickly and the waitress came by quickly to take our order. Though the place was not full at 8pm on a Thursday night, it was not empty either. Just right in terms of ambiance for a quiet dinner. Tej – A Sweet honey-wine. It is often homemade and is of varying strengths, ranging from the very sweet and almost non-alcoholic “birz”, to the stronger and less sweet true tej. The injera that came with our platter was definitely new to me. I was hesitant at first because the texture and look of injera is very spongy and I didn’t know what to make of it. But once I realized the lack of silverware at the table, I knew where this was going. I quickly tore off a piece and scooped up some meaty goodness. To my surprise, I enjoyed the injera more than I thought I would, and it made the meal, in its entirety, feel very filling. As far as our entrees, everything was very, very spicy! It reminded me much of spicy Indian food. I liked the texture and taste of the lamb on the doulet but the liberal addition of jalapenos was a mixed-bag for me. It seemed to overpower the other components of the dish. The best part of the doro wot is the flavoring of the stew, which was a spicy red-pepper sauce. I also thought the whole egg thrown in was pretty neat. I was unimpressed by the portion of chicken in this dish though. I expected to get way more than one chicken drumstick in this entree for my $12. Next time maybe they can tell me this chicken leg was certified 100% organic free-range poultry. That would help cheap me feel more at ease with this order. As far as the honey wine, we loved it! We were surprised to find out from our waitress that it is entirely homemade. Tej was definitely unlike any drink we’ve had previously and has a very unique taste and after-taste. 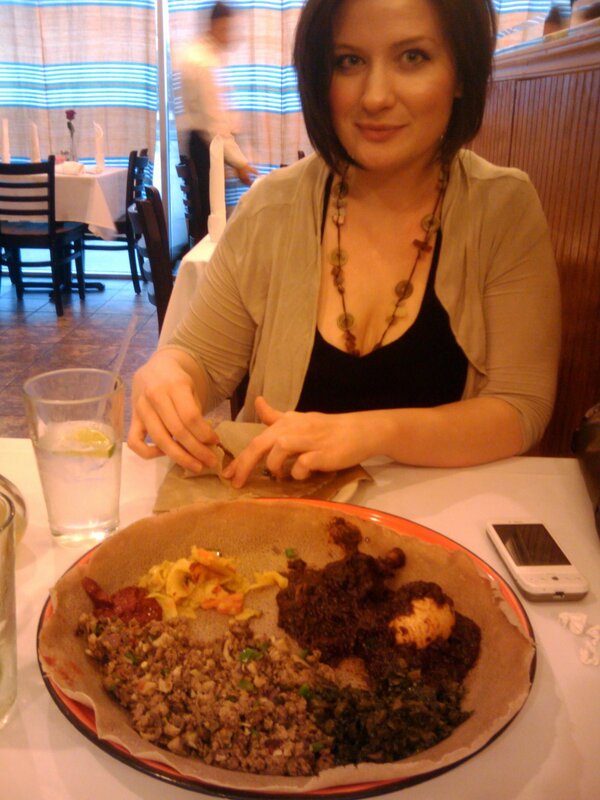 As a cultural learning experience, I’m glad we got to try Ethiopian cuisine at Blue Nile. It was definitely new and eye-opening. Dining with our hands was unexpected but cool. I wish they provided table-side hand washing (I read about this custom after the fact) because that would been good in this type of environment but what can you do. I bet most vegetarians would love this place as that part of the menu seems to be a strong suit. I’d definitely recommend Blue Nile for that regard and would try the vegetarian combo myself next time. The dishes we did order this time around were good. Like I said, Ethiopian food definitely reminds me a little of spicy Indian food. My only complaint is that portion-wise, it filled us up, but still a little light for the price on dishes such as the doro wot. All in all, Blue Nile was a unique dining experience and I’m glad I tried Ethiopian for the first time. Seek out this place for yourself and chalk it all up to cultural discovery. This entry was posted on April 25, 2010 at 1:47 pm and is filed under Culture, Food. You can subscribe via RSS 2.0 feed to this post's comments.